My youngest daughter turned six last week. Good thing she’s such a delightful six-year-old or I would be having more trouble with the fact that my baby is definitely not a baby anymore. She asked for a “spring” theme for her birthday party, and that morphed (butterfly pun intended) into a butterfly theme. 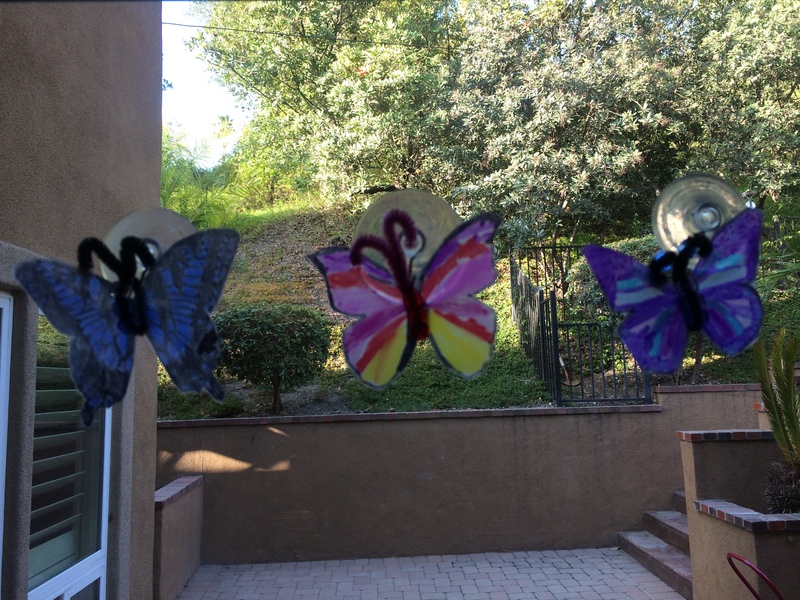 So this weekend we had a houseful of 13 kids and 15 adults for a pool party and barbecue, kicked off with butterfly-themed crafts that appealed to girls and boys ages 4-13. First each child decorated his or her own party favor bag (three for a dollar at Dollar Tree; I chose pink, yellow and orange). 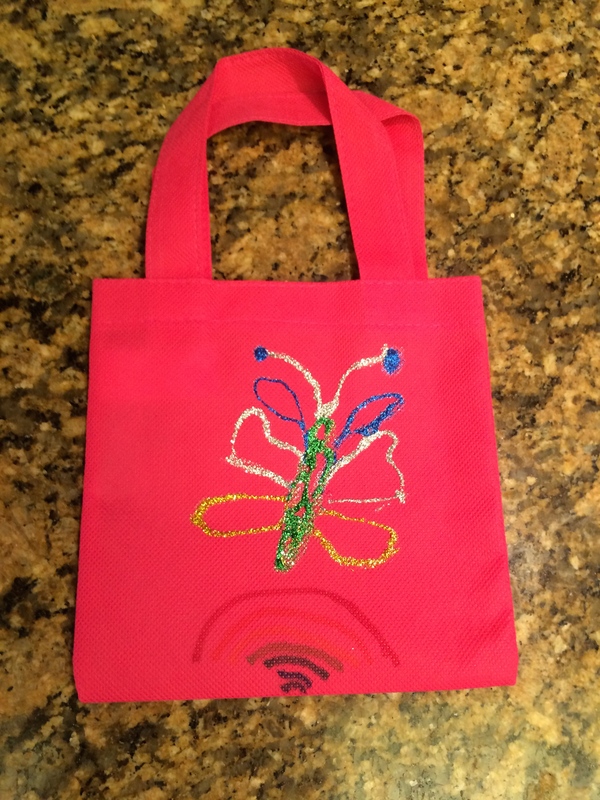 The kids used glitter glue ($1 pack from Dollar Tree) and permanent markers to draw pictures or write their names on their bags. My 9-year-old stuck with the butterfly theme for her party favor bag. 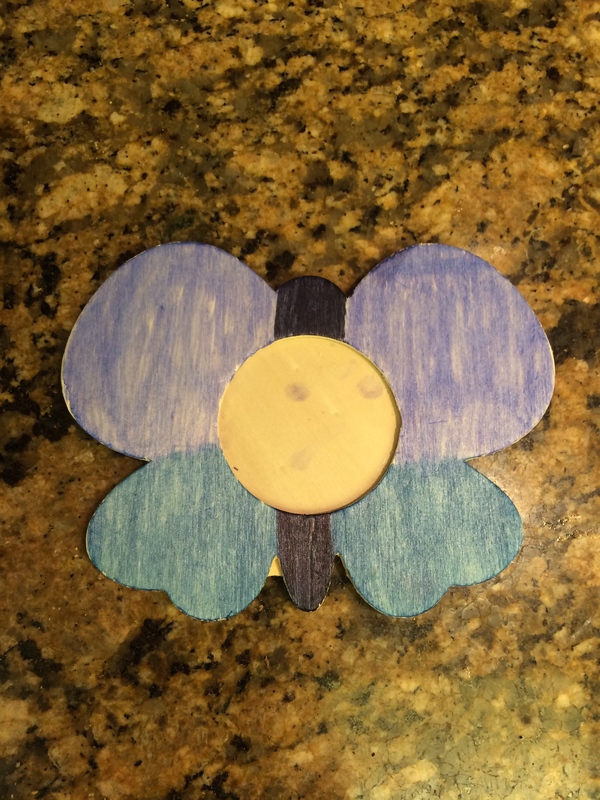 Then each child got to select a small wooden picture frame (in the shape of a butterfly, sun or flower, $1 each at Target) to decorate with Sharpies and/or stickers. More of my 9-year-old’s handiwork, just waiting for a picture to put in the frame. Then came the most fun project: making milk carton butterflies to hang on the windows with suction cup hooks. 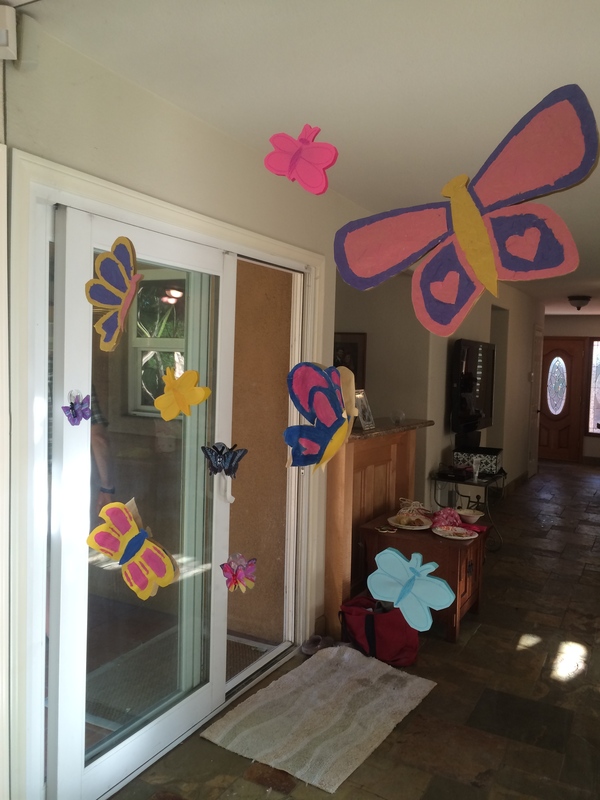 My 12-year-old made butterfly decorations for the party and the kids added their milk jug butterflies during the party! To make the cake they followed the instructions from this How to Make a Butterfly Cake tutorial by Betty Crocker, but they used this DC Cupcakes vanilla cupcake recipe for the cake mix and frosting. 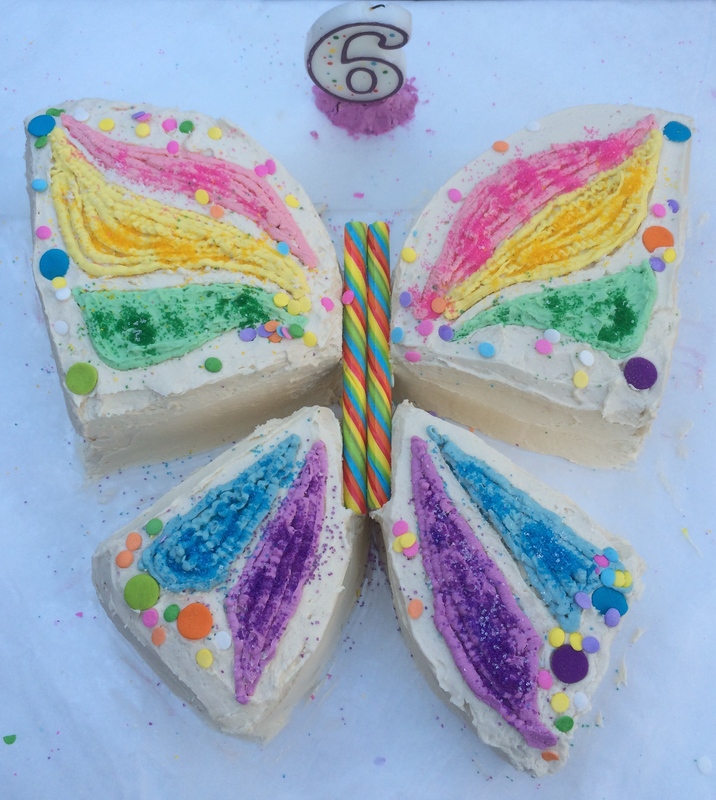 The rainbow-colored candy sticks for the body of the butterfly were $4.99 for a pack of 25 from Party City. So, with a little advance planning and shopping, we had a lot of fun with the butterfly theme! Do you have a favorite birthday memory? My favorite birthday theme was an angel-themed party complete with angel wings, gold halos and an angel birthday cake with tiny silver decorative balls on it! WOW!!! I don’t know what I’m more in awe of – the cake, the fact that you had 28 guest (so many kids) or the pure awesomeness of the crafts you did!!! Sounds like a party that will be remembered always!!! Thanks Kim! There were 13 kids (including my 3) and 15 adults and I am so lucky to have friends that pitch in to help with the crafts, swim supervision, and grilling the hamburgers etc. I love having a party with my daughters’ friends and their siblings and parents! We don’t have a lot of family out here and these are our substitute “cousins”! We are the same – friends are like family in our world!!! I wish you all could have been here too! The kids had a lot of fun playing on the inflatable crocodile pool toy you gave the birthday girl! Thank you!